Well we know most likely ALL of Z's foals will have a "Z" in the name somehow. As it should, what a great way to honor her. Thanks for my chuckle of the day! "Stinky" LOL! I love it! I really feel like little red has the temperment and confirmation to be one of the greats and this name is perfect! OH MY. The nickname I said "Zi" that's what it looks like he is called. LOL I didn't even see that before. I'm with you, Louise. Loved Ziconic at first sight. Didn't love Cozmic One, still don't, but have come to accept it. I think they should have left the One off. Not my decision, though. They love to surprise us, don't they? ….the name Ziconic is so unbelievably perfect. The Blog say Jerry named him! I think this is "Jerry's colt". Not saying that Ann didn't have a hand in it or that she isn't seriously "in love" with the red one, but I think there was a unique bonding with Coz the minute she sat down in the straw next to him minutes after his foaling, and Jerry has found himself likewise drawn to Ziconic. It's kind of like when you have multiple dogs or cats that are part of the same family; they are all loved, but sometimes there is a connection that happens between a pet and one of the owners. I wonder who went out and did that! They even added a photo. 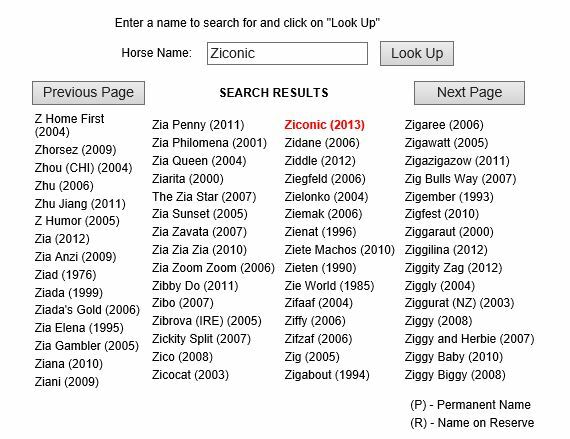 Interesting that the name Ziconic is not reserved but Zi is already registered with the name. When Coz' name was announced the name was still in the on-line name registry as reserved. Re pedigreequery...anybody know what the green asterisk by some dam names means? I think it means they have a pic of them but I'm not sure? Nope. MRS. PETERKIN (USA)* has the asterisk and no photo. I hope I am pronouncing it correctly....with a long "I"
How do you know what he is called? I couldn't see anything indicating this. That's how I am pronouncing it. Blog post the photo that is going up for sale the caption says Zi. Joanna_TX, Ellen Parker created through research a list of 500 or so of the most influential mares of the last century. Called Reines De Course (Queens of the turf), they are the ones with the green asterisk. I never knew that so glad you brought it up. I love the name Ziconic. I'm like Louise, I didn't like Cozmic One very much when I first seen it. I do now, I think it fits him, but I'll always think of him as the Prince and I'll no doubt think of Ziconic as Lil' Red because that is what he is to me. I did note that Jerry named Ziconic and as Ann did when she named Coz, he explained why, Z for Zenyatta in front of "iconic" because he is from the iconic Z. Perfect for him when you factor in his regal air, like he just knows he is someone special. Has anyone tried to get on the shop site? It is free S&H on the Ziconic portrait as long as team Z is at LE for the birthing. Yeah, every time I tried to get on I kept getting Oops! Site Failure. Something tells me they are sold out! I love the name Ziconic. And I'm so glad they didn't pick something with Tapit in it. Not because I don't like him, just because I don't think that the sires need to be honored in any of Z's foals, as she does 99.9% of the work. And it would be unfair for one sire to get honored and not any of the others. It took me a few minutes to get used to it, but now I think Ziconic is absolutely perfect! I wonder if he'll have a nick name like Coz...the first thing I think of is Conner but there's tons and tons of possibilities.